Over three thousand years ago, a murder takes place on an island in a river flowing through the hilly region of Italy later known as the ruma. This bloody act presages the rise of one of the ancient world’s most ruthless empires. 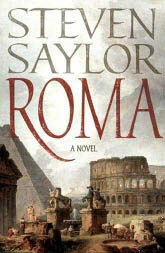 In Roma: The Novel of Ancient Rome, Steven Saylor takes us on a thousand-year journey from Rome’s mythical beginnings as a trading post for salt sellers through its evolution into an empire, in a style reminiscent of James Michner. Along the way we witness Hercules‘ destruction of the monster Cacus; the founding of the walled city of Rome by a couple of young bandits named Romulus and Remus; the abduction of the Sabine women; invasions by enemies; and revolutions by generals, plebeians and slaves. Throughout, Saylor provides us with real people and understandable motivations, whose stories have been transformed over time into the stuff of myth and legend. Covering a thousand years in 555 pages is impossible, so Saylor uses a series of eleven linked chapters, dipping in and out of the stream of time; while following two families, the Potitii and Penarii, through the generations. Through it all, these families interact with key players in Roman history: Coriolanus, the rebel general; Scipio, known as Africanus for his defeat of Carthage; the heroes of the people, the Gracchi brothers; Sulla the dictator; and, of course, Julius Caesar. Saylor gives several key female characters some space, as well; from Lara, the founder of the line; to Potitia, a Vestal Virgin trapped on the Capitoline Hill during the siege of Rome by the Gauls; to Cornelia, the mother of the Gracchi. This book required a tremendous amount of research, above and beyond the stories of individual people. Saylor deftly weaves in information about the evolution of place names, food, clothing, religious institutions and practices, public holidays and celebrations, political ebb and flow. The problems faced by the growing Republic are eerily reminiscent of the challenges faced by our own, much younger country: class war, religious intolerance and witch hunts, cynical political manipulation by the rich and powerful, and war mongering to avoid domestic unrest. I truly enjoyed this reading experience. Roma introduces the reader to events that receive short shrift in most history books. Although it covered a vast sweep of time, I felt the story telling was consistent and the characters varied and interesting. This is a wonderful achievement in both effort and results. Among the “extras”–including an interview with the author, a historical essay and reading group questions–I particularly liked the maps of Rome at the beginning of each chapter, showing the walls, major landmarks, public buildings, temples, and altars. It’s a great way of showing Rome’s expansion and evolution. “Thanks” to Saylor for a great read. I just finished reading the book and I found it so interesting that was hard to stop reading to go on with daily life. I found the chapter of the Vestal utterly sad and depressing, same as with Icilia and T. Ponitius…What do you think of those chapters?